I first became aware of my personal career hero, Aziza Shad, when I was looking up pediatricians for information on medical careers. Aziza Shad is an experienced pediatrician oncologist, who started her work in Pakistan, where she grew up, and made her way to the United States with the same interest in working as a pediatrician. What specifically attracts me to her is her attitude towards her purpose in life and how she lives it. She is determined to always be there for her patients, and that is how I want to be when I become a pediatrician. She started her work in Pakistan, where she saw hundreds of children every day who needed help. She really wants to help children, and not just medically, but emotionally as well by becoming their friend. I also love that Aziza still travels to rural countries that really need medical supplies and help with medical care. I love that she is adventurous and willing to help others beyond who she is “assigned” to help. She could care less about the money, all she wants to do is help a kid live a full, healthy life, and this is why she is my personal career hero. Aziza Shad is a pediatric oncologist and works at the Lombardi Comprehensive Cancer Center at Georgetown University in Washington, D.C. She treats child cancer patients who come to her for her medical skill and wonderful people skills. She is the chief in her area, which is the division of pediatric hematology-oncology, blood and marrow transplantation, or simply said, the cancer wing of the hospital. Pediatric oncology is treating children, up to the age of 18, that have cancer. A person that works in this field has to have a strong, brave heart to get through the rough parts, especially if a patient doesn’t make it. To become a pediatric oncologist though, there is a lot of education and schooling to do first. First you have to earn a 4-year bachelor degree, usually in a scientific or pre-med area. After graduating, you then have to attend a four-year medical school, specific to what you want to do. After finishing med school, you need to do a 3-year internship residency to become a practicing pediatric oncologist. The average income of a pediatric oncologist is about $205,999. As a child, Aziza lived in Pakistan and went to college there. Since she was a child, she always wanted to help people, and with this character trait, she trained to become a doctor in school. Aziza has always been very smart and this got her to graduate as number one in her college class. She loved meeting with children when she worked in Pakistan. In college she would always be one of the smartest students and I believe this was because she had a true passion for what she wanted to do. Aziza followed the medical path to enter her career. She went to college and medical school, where she excelled, and started working in a small town in Pakistan. A little bit down the road she worked in a bigger community in London. Now in the United States, she is the chief of her ward in the community. All of that hard work really paid off. Aziza Shad contributes to society through her medical abilities and her loving, strong heart. Her job isn’t just a job to her; it is a big part of her life. Her goal is to keep as many of her patients alive and healthy as she can. She keeps in constant contact with all of her patients and their families in case they need any help, if they are sick or if they just need someone to talk to. She also contributes to other societies in rural countries. She makes sure she takes trips to other countries and gives medical help to the children that really need help. She loves children and really wants to see them live a strong, happy life, and if she can give that to them, she is filled with joy. Keeping in touch with her patients is one of the most important things to her and her job. This is what makes her such a good doctor. In order to live a life similar to Aziza Shad’s, I will have to do a really good job in school. I will have to choose all the right classes to get into a good college to study medicine. I will not mess around with the wrong people or things, and that will keep my mind straight so I can reach all of my goals. In college I will have to excel, do a very good job and not just for the job. I already love children and love to see their smiling faces, it brightens my day. The same thing made Aziza smile. In some ways we are alike. She loves to travel and help people in other countries. That is one of the things I would really like to do when I am at that point. We both have strong hearts also. I want to help as many people as possible and save as many lives as I can. But no one can save everyone and even though Aziza has a close relationship with her patients, she has to be strong when she can't save one. This may take some time for me to be able to do because I hate to see anyone die, especially people I care for. I think Aziza and I have pretty much the same personality--caring, adventurous and we love to help others. I hope to become as good a doctor as Aziza Shad because she is my hero and many other children’s hero as well. 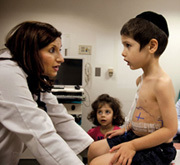 Education Requirements.com - Information about the education requirements for becoming a pediatric oncologist. Cejeka Search - provides information about compensation for physicians in different specialties. Ehow - View a Pediatric Oncologist Job Description.